The CNO first considered developing a family of inexpensive EW suites to replace and/or complement existing and planned ship surveillance sen-sors in the early 1970s. The decision was in response to the Anti-Ship Cruise Missile (ASCM) threat that became evident following Egypt�s sinking in 1967 of the Israeli destroyer ELATH using a Soviet SS-N-2 STYX. An analysis of ASCMs in development led to the conclusion that the existing AN/WLR-1 and AN/ULQ-6 systems installed on most ships could not counter ASCMs in time to prevent a hit. In addition, hard kill weapons were not effective because there was little early warning of an attack due to the characteristics of ASCMs. Shortly after production began, the Secretary of Defense directed the implementation of the Electronic Warfare Improvement Program (EWIP) to ensure that system performance was upgraded to meet evolving threats. 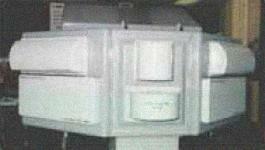 The resulting improvements were implemented starting in 1987 and the system was given the nomenclature AN/SLQ-32A(V). 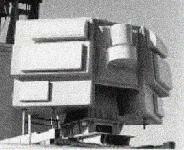 Various Engineering Change Proposals (ECPs) were incorporated as part of the �Alpha� variant. Examples include Band 3 Improvements (ECP 206) which increased ES range by increasing the sensitivity in Band 3 and providing high elevation angle coverage; Digital Processor Unit (DPU) Upgrade (ECP 463) which incorporated a 20 MB hard drive, and provided a new processor that was three times faster than the old system; Interference Suppression (ECP 469) which improved Continuous Wave (CW) high pulse repetition frequency processing capability, increased the number of Band 3 Electromagnetic Interference (EMI) filters, increased the flexibility of the two existing fixed frequency notch filters, and reduced the processing load of the Digital Tracking Unit; and Semi-Omni Antenna for Band 3 (ECP 470) which provided increased isolation from own ship emitters by reducing the gain in the direction of the transmitters and sea reflections, and increased antenna gain in the direction of threats and improved elevation coverage. Additional improvements were made but were not part of the �Alpha� upgrade. The Radio Frequency Isolation Self Test (RFIST) for the AN/SLQ-32(V) is approved for use and the support structure has been established. When the AN/SLQ-32(V) is performing electronic attack (EA), some of the radiated energy is reflected from the superstructure and detected by the Electronic Support (ES) receivers. The AN/SLQ-32(V) employs a process called Dynamic Threshold Leveling (DTL) that prevents radiated energy from being perceived as a new emitter, causing operator confusion and resource drain. DTL uses constants embedded in the operational software to desensitize the receiver thresholds based on the transmission�s angle and frequency to essentially eliminate false emitters caused by these reflections. RFIST was developed to replaced earlier isolation methods and systems that were manpower and equipment intensive, time-consuming, and external to the SLQ-32. RFIST utilizes the SLQ-32 receiver and transmitter systems under software control internal to the SLQ-32 itself, loaded by a separate magnetic tape cartridge (MTC) or from the hard disk in the same manner as existing SLQ-32 operational and diagnostic software. In the past, specially trained personnel using special test equipment determined these constants. Because this process was expensive and logistically difficult to accomplish, measurements were infrequently taken or not taken at all. RFIST allows each ship�s company to perform its own measurements at a convenient time and periodicity. Because even minor changes to the area around the AN/SLQ-32(V) antenna enclosure or superstructure can change the reflecting characteristics countered by the DTL process, the RFIST process should be performed whenever changes in ship configuration occur. The more data that is available for a ship, the easier it is to recognize bad data when it occurs. Additional data also increases the confidence in the values embedded in the software. It is therefore beneficial to run RFIST as frequently as is practical. Although essential for the correct operation of the DTL process in the operational software, it is not necessary for the DTL gate width timing alignment to be properly set in order to run the RFIST program and get good results. It is essential for the AN/SLQ-32(V) to be free of faults that might affect correct operation of the system�s radio frequency part. Blanking has reduced or eliminated most interference from own ship�s pulsed emitters in the AN/SLQ-32(V) Countermeasures Set. Blanking disables the RF front end on a receiver that is effected by an own-ship�s pulsed emitter for a set period of time when the emitter generates an RF output pulse. To minimize degradation (receiver off-time), blanking should only occur when it is actually needed. The AN/SLA-10B Blanker Unit associated with the AN/SLQ-32 used one blanking pulse width and delay to process each pretrigger input. To ensure the interference is reduced to a minimum, the blanking pulse�s duration is set to blank the emitter�s longest pulse duration and the worst case situation of sea return. For all but worst-case situations, this adjustment will result in overblanking of the AN/SLQ-32. Optimum blanking alignment is achieved when PULSE DELAY and PULSE WIDTH controls are set to the minimum values needed to provide consistent blanking, while limiting the impact on receiver �OFF� time. Insufficient blanking will cause Own Ship emitters to be processed and dis-played, while excessive blanking reduces receiver �look time.� Blanking procedures should be performed in a normal sea state environment to minimize the effects of weather conditions on the receiving capability of the AN/SLQ-32(V). When high seas exist and sea return presents a problem, blanking pulses may be increased to compensate for reflection of ownship emitters. However, blanking pulses should be returned to normal sea state alignment settings once the weather conditions return to normal. The upgraded DDI Console is a Standard AN/SLQ-32(V) Console with a bullnose modification allowing for control of up to six decoy launchers, FAB functionality modifications, and additional circuit cards that provide fully automated decoy launch capabilities. 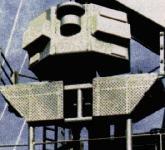 All AN/SLQ-32(V) units were originally slated to receive DDI Consoles; however, development of the Nulka decoy and reduced funding have limited the number of DDI Consoles being procured to approximately 40 units. When the Mk 36 Decoy Launching System is modified to add Nulka capability (changing the designation to Mk 53), all the launchers are connected to the new Decoy Launch Processor, which duplicates many of the hardware improvements found in the DDI Console. For this reason, ships with Nulka installations planned will retain the Standard Console, while the DDI Consoles under procurement will be directed toward non- Nulka ships. With the integration of DDI, the system can now make anticipated platform modifications. For single emitter identification, R17.00 prevents correlation of emitter candidates that don�t have anticipated platforms with existing platforms that do. It also prevents the operator from eliminating emitter candidates with anticipated platforms. Another capability is the implementation of Selected Emitter Automatic Response (SEAR) to initiate EM jamming against non-missile threats with minimum operator actions. This will compare new emitter detections against operator defined automatic engagement criteria (ELNOT, bearing sector), and engage new emitters automatically without operator intervention for positive comparisons. 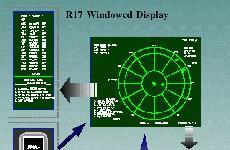 R17 software dramatically changes AN/SLQ-32A(V) operation in the human interface, system operation, and threat engagement areas. Among these changes are Deceptive EA and Decoy Integration (DDI) algorithms that allow for system control of decoy launches and coordinated engagements. R17 is not compatible with previous software loads (R16, etc.) because data is not necessarily written to identical locations on the hard disk as previous software versions. Additionally, libraries saved to the hard disk are not interchangeable between software versions. Prior to loading R17 software onto the AN/SLQ-32(V) hard disk, it is imperative that any previously loaded operational software versions be removed. A number of ships have reported problems in connection with loading or running Revision 17 (R17) operational software and the Revision 10 SDT using the hard disk. These problems include system crashes when operating from the hard disk, the inability to fully write the software to the hard disk, and the inability to load from the hard disk. In each case, it was discovered that the ship had not removed a previously loaded version of operational software from the hard disk.